Forces of the West African Republic of Trans-Ztumsia (WARTZ) aided by mercenaries from Sierra Leone severely mauled a column of religious fanatics from the Ztumsian Independent Tribal Spiritualists (ZITS) this week as fighting continued in south-eastern Ztumsia. Following last week's victory by an allied force of WARTZ and the People's Army for the Nation and Tribes of Ztumsia (PANTZ) over a combined force of ZITS and troops from the Free African Rhodesian Territories (FART) the WARTZ succeeded in bringing the remaining ZITS to battle while the PANTZ column completed the destruction of the FARTs and pursued their routing survivors back over the Rhodesian border. Making use of the superior reconnaissance provided by their helicopters the WARTZ column managed to catch the ZITS forces separated and pounced on an isolated grouping of militia units supported by a single unit of regular technicals deployed in a the area surrounding the Petramco fruit processing plant at Zulawayo. Colonel Colin Campbell, commander of the WARTZ forces, sent a mobile column comprising the mercenaries and two units of technicals on a wide outflanking movement to attack the ZITS from the north before he moved on them from the south with his remaining forces, elite units of Marine Infantry and armoured cars, and a unit of militia. 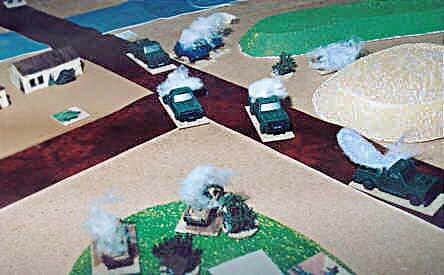 The first units to engage in the battle were the WARTZ helicopters who strafed ZITS militia occupying a farm complex. These militia soon routed after the Sierra Leonean technicals joined in the bombardment of the farm . The mercenary infantry then captured a hill which dominated the whole battlefield and dug in to defend it against any attackers. The helicopters moved on to attack a further unit of militia deployed in the fruit processing plant but were running low on fuel and had to leave the battlefield. 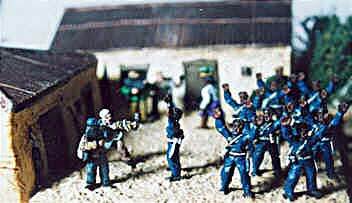 The remaining WARTZ forces arrived from the South and attacked towards the fruit processing plant, but were themselves attacked in the flank by a newly arrived ZITS militia unit. The WARTZ professionals turned to face the militia and, after a brief firefight, the ZITS fled the field. WARTZ Marines advance supported by an armoured car. The ZIT militia break and run. Throughout the action he ZITS technicals had stayed in reserve as their commander seemed unable to make up his mind as to whether they should join in the fighting in the north or in the south. Finally making a decision he charged up the road to the north towards the WARTZ technical and the mercenary forces. 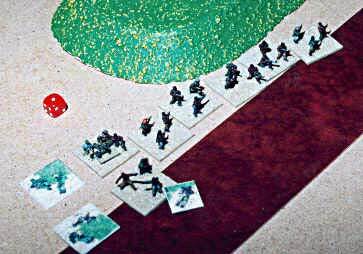 The ZITS initially gave a good account of themselves, destroying a unit of WARTZ technicals, but they soon ran to a halt against the guns of the mercenary infantry who found themselves attacked in front by ZITS militia arriving from the north and from behind by the technicals. Undaunted they destroyed two ZITS technicals with small arms fire while their technicals disposed of another one . The mercenary technical unit lost two of their three Toyotas to fire from the ZITS. Destroyed technicals litter the landscape after the ZITS desperate charge. Night fell over the battlefield before any of the ZITS regular forces or their leader Heviosso arrived and with the WARTZ column in complete control of the battlefield. The remaining ZITS militia and a single surviving technical fled from the area in complete disorder. It is believed that Heviosso, Prophet of Agassou and Commander in Chief of the ZITS was not in command for this battle. According to WARTZ sources ZITS prisoners variously said he was "In the hills communing with Aggasou", "Having a holiday at Sun City" or "In Switzerland seeing his bank manager". Ztum-Setum News has also had reports, from usually relaible sources, that he was visiting South Africa. It seems likely that he combined a visit to his South African paymasters with a short holiday break. Heavy fighting broke out in South Eastern Ztumsia yesterday as forces from the Peoples Army for the Nation and Tribes of Ztumsia (PANTZ) and the West African Republic of Trans-Ztumsia (WARTZ) formed a temporary alliance with the aim of driving a strong column of Free African Rhodesian Territories (FART) forces back over the border and out of Ztumsia. The allied forces routed all FART units in the area and the fleeing soldiers which were only saved from complete annihilation by the arrival, late in the day, of troops from the Ztumsi Independent Tribal Spiritualists (ZITS), who attacked their traditional enemies of PANTZ and WARTZ. A unit of the Ztumsian SAPS (Special Armoured Police Service) is reported to have suffered heavy casualties as it joined in the desperate attack that finally broke the FART's resistance. PANTZ (People's Army for the Nation and Tribes of Ztumsia) forces have captured a band of religious fanatics who have been committing atrocities against peaceful villages in western Ztumsia whilst masquerading as law enforcement officers from SAPS, Ztumsia's highly professional Special Armed Police Service. The captured terrorists, all members of ZITS (The Ztumsi Independent Tribal Spiritualists), are pictured here being filmed by crews from the BBC and South African Television. (Click on picture for a full-size image). The arms race in Ztumsia/Setumsia looks set to escalate with weapons salesmen from all over the world being spotted in the area in recent weeks. Among the arms systems reported as being in particular demand by the various factions are Buffel APCs and mortars. It is rumoured that the Setumsian police are being equipped with APCs and light tanks by the USSR.